Vladimir Putin and Japanese PM Shinzo Abe have worked out a statement on the prospects of joint Russian-Japanese economic activities in the South Kuril Islands as the Russian leader arrived in Japan for what’s seen as a breakthrough visit. The two leaders dedicated 40 minutes from their three-hour talks in Abe’s ancestral hometown of Nagato, a mountainside resort in southwest Japan, on Thursday. The time was spent to develop an agreement on joint activities on the Kuril Islands “that would be suitable to both parties,” Yury Ushakov, the Kremlin aide, told reporters. 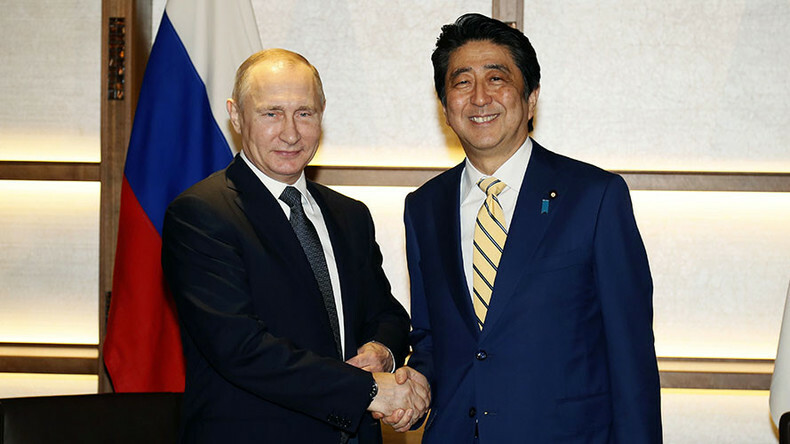 Putin and Abe had to discuss the issue one-on-one after Russian and Japanese experts failed to agree on the wording of the statement, he added. According to Ushakov, the statement on joint Russian-Japanese economic activities in the South Kuril Islands, which may concern fisheries, tourism, culture and medicine, will be published tomorrow. Abe told reporters the leaders “thoroughly and frankly discussed the issues of free access to their homeland by former residents of the islands, joint economic activities between the two countries with a special economic zone on the islands, as well as the issue of a peace treaty." Russian presidential spokesman Dmitry Peskov later stressed that the Japanese side had no objections to working in the framework of Russian law in the Kurils. “The issue of sovereignty [of the South Kuril Islands] wasn’t raised in any way. It’s not up for discussion here,” Peskov said. Tokyo’s claims on Russia’s Southern Kuril Islands of Kunashir, Shikotan, Habomai and Iturup, which Japan calls "the Northern Territories," is one of the reasons for frosty relations between Russia and Japan. The two countries still haven’t signed a peace treaty after World War II because of the lingering territorial dispute. Putin and Abe also agreed to restore military cooperation between the two countries as well as ties in the spheres “frozen” in recent years, Russian Foreign Minister Sergey Lavrov said Thursday. It was agreed to resume “2+2” ministerial talks, which would involve meetings between foreign ministers and defense ministers of both nations, he explained. “We have an impression that our Japanese colleagues now understand better Russia's concerns in this matter,” Lavrov said, adding that Russia and Japan had confirmed mutual interest in cooperation on security issues, despite what he called “special relations” between Tokyo and Washington. “Naturally, they [Putin and Abe] exchanged views on the Syrian settlement and situation in Ukraine….. Here our positions almost coincide," he added. The first day of Putin’s visit concluded with a traditional "Kaiseku" meal, which reportedly included Fugu, a Japanese delicacy prepared from the poisonous puffer fish that requires the chef to have a special license for cooking. To celebrate Putin’s visit to the Island – his last trip was 11 years ago - local schools in reportedly served borsch and pirogi, which are common in Russian cuisine. After the dinner, the two leaders were expected to visit a hot springs resort in Nagato. Abe invited Putin to take a dip in the onsen, a traditional steaming bath. "When you take a bath in the springs, all the fatigue just goes away," he told the Russian leader. In response Putin said: “As interesting as that sounds, it's better not to get too tired." The day was concluded with stargazing at a local observatory. The two also exchanged memorable gifts, with Putin presenting Abe with a vintage "samovar," a traditional Russian coal-fueled tea maker, produced in Tula in 1870. Another present was a painting by contemporary Russian artist Igor Razzhivin, entitled "A Russian Troika in Kolomenskoye Village." Abe responded with a very symbolic gift, which was a high-tech replica of the painting called "The Arrival of Putyatin." Russian Admiral Yevfimy Putyatin and Japanese official Toshikara Kawazi signed the Japanese-Russian treaty of friendship and established diplomatic relations back in 1855. The second day of Putin’s visit will see the Russian leader travelling to Tokyo for the continuation of talks on Friday. The negotiations are expected to end with agreements on closer economic and cultural cooperation, while there is little expectation of a breakthrough on the territorial dispute over the Kuril Islands.